How To Relieve Nasal Congestion? 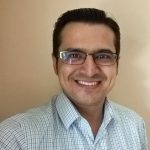 How To Prevent A Stuffy Nose In Babies? Imagine your troubles on a day when you have nasal congestion (a stuffy nose). You cannot breathe, of course, but you also cannot eat, speak, or sleep. In short, your life seems to come to a standstill. If this is the agony for a grown up, how difficult would it be for a baby? They get frustrated and cranky. They refuse to eat or sleep and get tired. So, what do you do in such a situation? Is there a way to identify the symptoms and act in time to prevent nasal congestion in babies? MomJunction guides you on that while also explaining the causes and the ways to bring some relief to your baby. What Are The Symptoms Of Nasal Congestion? A chronic runny nose: The nose is drooling mucus all the time, and there seems to be no end to it. You wipe it once, and then it gets messy again. Noise while breathing: There is an audible ‘whistling’ sound every time the baby breathes in and out. The noise can be sharp and shrill depending on the severity of the condition. Snoring can happen due to various reasons and nasal congestion is one of them. If the baby breathes noisily during the waking hours, then he is likely to snore while sleeping. Baby picking at the nose: Babies do not understand what is happening to their nose. Therefore, to alleviate the obstruction, they pick their nose with their fingers inside the nostrils. This happens in older infants with better finger dexterity. Sneezing: Sneezing clears the nose, but it sometimes blocks it too. A stuffy nose stimulates the nerve endings of the inner lining of the nostrils, which respond through the natural reflex of sneezing. The symptoms are common and obvious, but they are not standalone as they are associated with some illness. 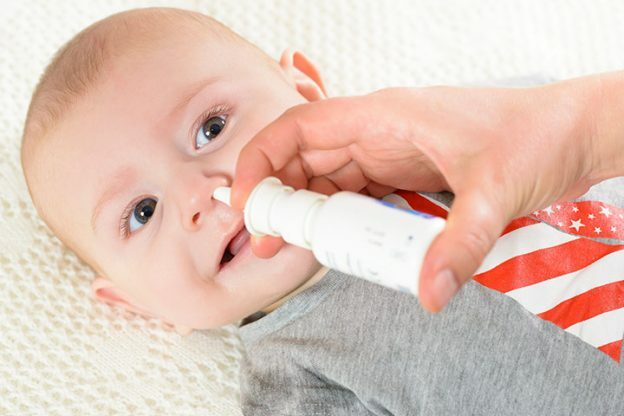 What Causes Nasal Congestion In Babies? It is the predominant cause for snotty noses in infants (2). There are over 200 viruses that cause cold, but rhinovirus is the most common of them all (3). Cold viruses increase the formation of thick mucus in the nose and inflame the inner lining of the nostrils. This restricts the flow of air into the nasal passages, leading to nasal congestion. Treatment: Treated symptomatically through antibiotics, cough and pain medications. The symptoms of influenza are similar to those of common cold, but the baby will also have a high fever. A runny nose is more common in influenza than inflammation of the nasal passages since the flu virus primarily targets nose, throat, and lungs (4). Sinuses are air-filled sacs located at the top and sides of the nose. When pathogens invade these spaces, they form surplus mucus, blocking the openings of the sinuses. Trapped germs and pathogens multiply within and cause inflammation and the further formation of thick mucus. The nasal discharge in sinusitis is usually thick and dark in color. Allergies cause stuffy nose in babies just like common cold and influenza. Many allergens, like pollen, can inflame the nasal passages and make them secrete surplus mucus. Rhinitis, also called hay fever, is one such allergic reaction that can lead to stuffy nose in babies. Treatment: There is no specific treatment but an allergy can be managed to the point that it recedes or disappears. Tonsils and adenoids are tissues that are a part of the lymphatic system. They are the first line of defense in the immunity system, and if they get infected, they can cause nasal congestion. An enlarged tonsil or adenoid can even put pressure on the nasal passages, constricting them and preventing normal breathing. Treatment: The infection can cure on its own if mild. Antibiotics help subside the intensity. In severe cases of chronic disease, the tonsil or adenoid is surgically removed. Nasal polyps are benign outgrowths of the nasal lining that appear as smooth, spherical, and beady structures of varying sizes. They are fundamentally tiny pockets of mucus stemming from the mucous membrane. Their cause is unknown, and they are considered the result of a genetic anomaly. Since nasal polyps grow right inside the nasal passage, they obstruct breathing. A runny nose is one symptom for the presence of nasal polyps (5). Treatment: A doctor will attempt to shrink the polyp using oral or injectable medication. If nothing works, then the polyps will have to be surgically removed. Asthma is the constriction of airways that makes normal breathing or breathing during vigorous activities difficult. Nasal congestion can happen if the babies have asthma due to an inflammation of the respiratory tissues. Noisy breathing due to the restricted pathway is common in this condition (6). Treatment: Asthma can be managed using oral and vapor-based medications that reduce its intensity and bring relief from discomfort. Disorders of the nose or sinonasal cavity can lead to a stuffy nose in babies. Some of the common problems are granulomatosis with polyangiitis, Churg-Strauss syndrome, and deviated septum. Granulomatosis with polyangiitis is the inflammation of the blood vessels in the lungs, sinus, and even nose, thus causing a runny nose (7). Churg-Strauss syndrome is a similar inflammatory disease that causes asthma and nasal congestion (8). Deviated septum occurs when the septum, the tissue that separates the nostrils, shifts towards one side, enlarging one nostril but shrinking the other. It can lead to trouble while breathing and congestion in the tissues of the nose (9). All these problems occur due to defective genes or genetic mutations. 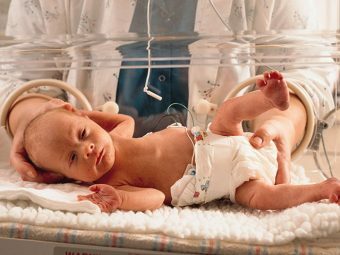 Treatment: A doctor will administer medicines to alleviate the intensity of the symptoms and provide long-term relief to the infant. It can range from pollution to dry air. Anything that can irritate the inside of the nose has the potential to trigger excessive secretion of mucus. Dry air can dry the mucus, which can harden causing difficulty in breathing. 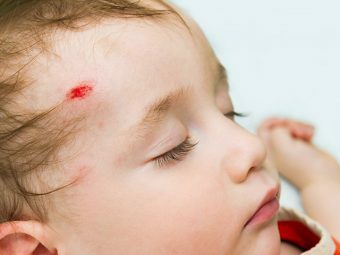 Treatment: Keeping the baby away from the irritant can prevent the condition. In the case of dry air, humidifiers are helpful. The reason behind that runny nose could simply be some stuff that your baby pushed up his nostril while playing. Babies can be fidgety, and they love putting things in their mouth. When they are extra playful, they may put something in the nose so deep that they may have a difficult time removing it. That object may rot causing an infection, and nasal congestion. Treatment: If you suspect there is something in your baby’s nose then inspect the nostrils under bright light. Take the baby to a doctor a proper checkup. Nasal congestion can happen at any age and can even affect newborns. The above problems are diagnosed symptomatically, and medication is prescribed accordingly. However, there are some simple things you can do at home to provide stuffy nose relief to the baby. Saline or salt water is a natural decongestant for a stuffed nose baby. You can buy this saline from a pharmacy or prepare it at home using one-fourth teaspoon of salt dissolved in 240ml of water. 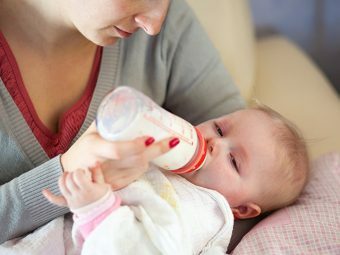 Make your baby lie on his back and pour two to three drops of saline water in the infant’s nose. Wait for 30-60 seconds after doing so. Turn the baby on his stomach so that the saline drains the mucus out. Use a tissue paper to catch the snot. Gently squeeze the baby’s nose to expel the remaining mucus. You can use this method even when the baby has dried mucus since saline will soften and release it from the nostrils. 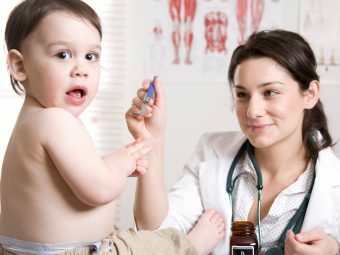 Using saline drops is a safe household remedy for nasal congestion in babies, and it is recommended by the American Academy of Paediatrics (10). The nasal suction bulb is also called an aspirator and helps bring the mucus out into the integrated rubberized container (bulb). Press the air out of the bulb to create a vacuum and place the tip of the bulb around the rim of the nostril. Do not insert it deeper since it may cause damage to the delicate inner lining. Gently release the squeeze grip, and the mucus gets drawn into the bulb. Press the bulb into a tissue paper to release its content. Rinse it with warm water before using it again. Keep the bulb exclusive to the baby and never share it with someone else including a sibling. Other remedies for nasal congestion, such as steam showers and antihistamine medicines, work for adults but may not be effective in babies. Never use decongestants or other drugs to liquefy dried mucus. There is no treatment for dried mucus and saline drops are the only safe option (11). 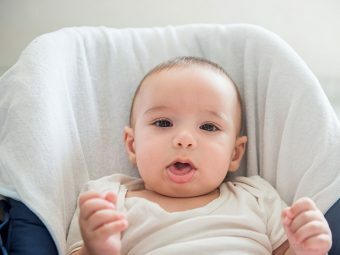 If the problem is acute, then take the infant to a doctor, who will prescribe the right medication for blocked nose and the underlying condition that is causing it. Mucus is blood-stained: Even a tinge of blood in the mucus could be a sign of some serious problem like a bacterial infection. Let the doctor take a look soon. Nasal discharge is green or yellow: Infections of the sinus or the presence of a foreign body in the nose are among the common reasons for staining the clear mucus. These can be removed through the medication prescribed by a qualified doctor. Nasal congestion is accompanied by high fever, sore throat, or body rashes: It could mean an acute viral infection or a bout of severe allergy. Swift medical attention is recommended. A runny nose is for more than 15 days: If it is flowing mucus for a fortnight, then better get the baby checked by a doctor. Baby is less than two months old: Newborn babies do not have the reflexes to expel the mucus nor can they breathe from their mouth. This precarious situation can interfere with other activities like feeding and sleeping. Instead of waiting for the situation to aggravate, take steps in the initial stages itself to avoid the stuffy nose problem in your baby. Keep the air and the baby’s surroundings clean. Keep dust and other pollutants at bay. Purchase an air purifier if your baby is sensitive to suspended particles in the air. Also, keep the baby’s personal items clean so that he does not ingest pathogens. Do not use deodorant or any other substance with intense fragrance around the baby, to prevent triggering an excessive production of mucus. Often, this can result in serious conditions such as asthma. Use a humidifier or a mist vaporizer if possible. It maintains adequate levels of humidity in the air to prevent dry conditions in the room. Dryness can lead to mucus formation in the baby. Nasal congestion is troublesome for the baby and you too. You can overcome the problem by taking care of the little one and making sure that his surroundings are clean. Use some simple remedies to clear up his nose. A clear nose means a happy baby. Do you have an interesting experience to share about nasal congestion in babies? Do let us know in the comment section below.